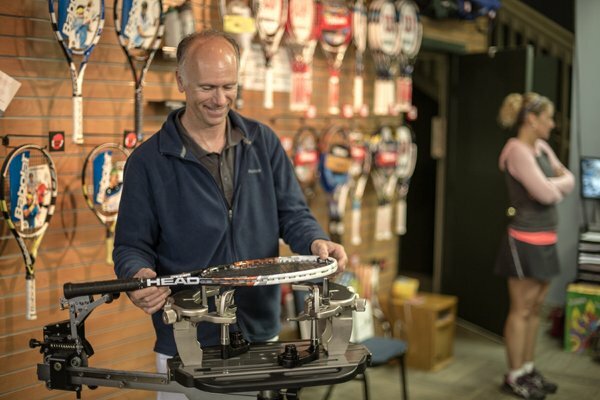 Maine Pines offers a full service pro shop with the up to date tennis racquets at very competitive prices. Try our demo racquets to see which best suits your game before you buy. We also carry a full line of men & women’s footwear as well as a variety of other tennis accessories. Jason has ​​been a tennis professional and racket stringer for more than 20 years. He knows that it is not only important to teach people how to hit a tennis ball but it is also important having equipment that performs well for each individual player. Jason will inspect each racket and give it 100% attention without a long wait. He is up-to-date with new string and can advise about your individual racket and style of play. Each racket is guaranteed a 48-hour turnaround with the exception of weekends. If your racket isn’t playing the way you want, Jason can also customize the racket to fit your specific individual requirements and needs. For instance, he can increase the grip size, change the balance of the racket, make a light racket feel heavier or make a heavier racket feel lighter. Please stop by the pro shop or call 729-8433 if you have any questions!